PACES FROM BEACH with no roads to cross and within close reach of shops and restaurants, this beautiful ground floor apartment forms part of a large traditional house. It is ideal family accommodation or for couples seeking a retreat. Bright and airy inside, furnished and equipped to a very high standard. Small dog welcome by arrangement in this apartment only. Great apartment. Very comfortable. Elie is a great town. We will definitely be back. Had a fantastic time on our holiday and we enjoyed our stay in the flat. 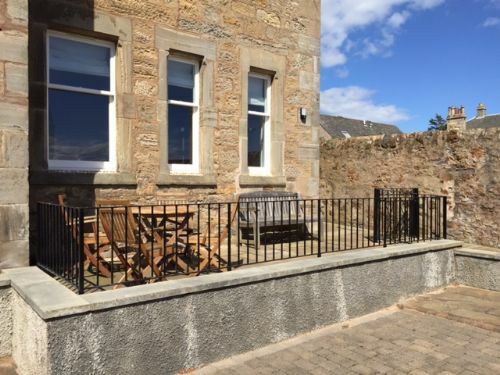 Fantastic week in Elie in this lovely home. Tennis, golf, fish & chips and lots of time on the beach. We'll definitely be back. Another amazing week in Elie. We all loved the flat and its really cute decoration! The paintings around the flat were all lovely. We are so sad that this week went so quick but we will definitely be back! !